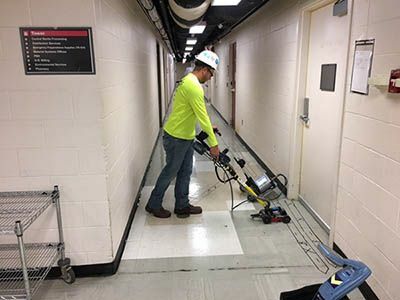 Ground Penetrating Radar Systems was called by a local contractor to scan the floor of an existing building prior to the installation of new sanitary lines. The scope of this project was to determine the locations of conduits and/or shallow utilities so that the contractor could perform their planned saw-cutting. The contractor wanted to avoid any repair costs, or lost time on the project, and they knew that if they called GPRS, they would be able to saw-cut without any issues. During the scan, we located, and marked out several conduits that were running in the area of the proposed trench, and the results of the scan were marked directly onto project surface. GPR is an accurate and effective way to locate items such as conduits, rebar, and post tension cables in concrete slabs. Additionally, GPR is a great way to locate underground utility lines and other near-surface items. For more information on how GPRS, LLC. can help you with your next project, please contact Mitch Streight at (614) 400-6889 or by email at mitch.streight@gprsinc.com.